Wetness, warm pine, piggeries, fertilizer factory pongs, wisteria, jasmine, gorse, damp earth, the sea, herbs. Warm, dry, full, tipsy, comfy bed, great food, Chateau de Valmy Premier Cru. Wet, wet feet, aching hands (from hanging on). Very steep hills in Llafranc (Costa Brava), tiny route from Trilla to Ansignan (PO), dangerous substances road to avoid the tunnels near the border, tiny windy road along the Gorges de Galamus (PO). More specifically, we stayed in a fabulous chambre d'hotes Chateau La Tour Apollinaire in Perpignan - beautiful, wonderful hosts, huge spaces, exquisitely decorated, superbly equipped - a pure delight. From there we headed down to Spain, to Tossa del Mar and Cadaques, staying in Guide du Routard-recommended hostelries. We've never been disappointed by a Routard place either for the hotel or restaurant. 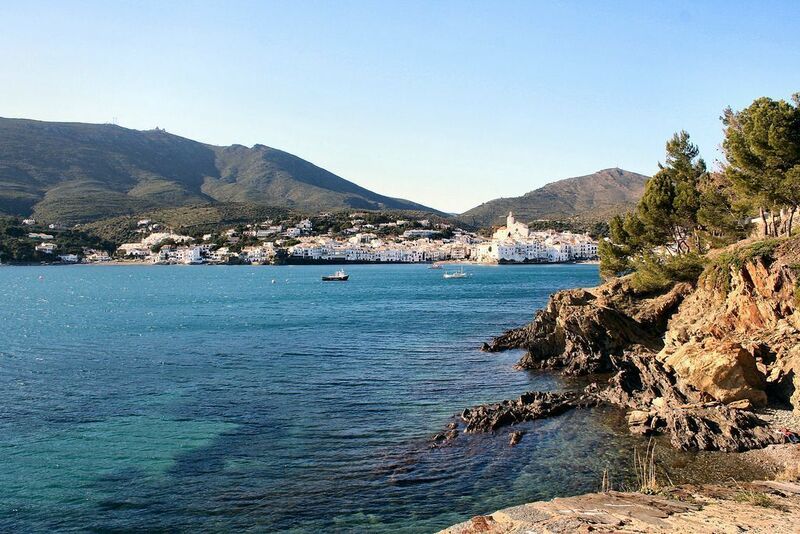 Cadaques was delightful. We dined, as recommended by the hotel receptionist, at Qu4tro on the front where the food was original and very tasty. Alcoholically, it was just a gentle stroll back to our hotel. Back in France, we detoured via Cathar country staying in Cucugnan and ate superbly at the Auberge du Vigneron. The sun was out for the drive home so we stayed off the main roads as much as possible preferring to take the minor roads via villages such as Bages, and then along the coast from Agde. In total we did 1200km which isn't huge but for an aprenti-biker such as me, was quite sufficient, and, more importantly, thoroughly enjoyable. In fact, we may go back to Cathar country this weekend! Oh Sarah, so glad you had a fabulous time, The Costa Brava is gorgeous, wild and beautiful, we did it by bike a couple of years back, in August, not an ideal time as the world and his dog were on holiday plus we had not booked anywhere, we were very lucky, we managed to get a room in every place we stopped. Cadaques is one of my favourite places and small world I know Qu4tro very well, it's a fabulous restaurant, so very different from the restaurants we have in our part. We recommended it to some friends of ours and when they went, they were very excited as Kristen Scott-Thomas was on the next table! Do go back to Cathar country this weekend, it will make you feel that the holiday is not over! Welcome back Sarah. I don't know Spain at all, which does seem a bit odd because I have explored most of the rest of Europe (I hate the bull fighting thing though). It sounds like you had a wonderful time clinging on to your man's waist as you sped along (gosh, that sounds dirty but no double entendres intended). Time to yourselves, how wonderful to be child free however much one loves them! I've been catching up on my reading and realise I haven't thanked you for mentioning me on your page about awards. A pleasure to have connected! What a small world, Dash! We ended up there because from where we started, most of the other recommended places along the way were closed. It was very empty though, no KS-T or anyone else really. Just us and another couple. The food was still fab though! The Costa Brava has some lovely picturesque minor roads and the ones along the coast are fab. He had a great time cos he was riding his bike and in control, and I had a great time cos I was behind and not responsible for anything :) well, except some map reading. Your trip sounds great. My bloke loves his bike, but I have yet to learn to enjoy riding pillion. I wonder if it would be better if I got my own bike and we put walkie talkies in the helmets? I suggested getting a bike to my beloved and he said I could only get a 125cc which is weeny and would not be able to keep up with his 1200cc which would be very frustrating for him and result in grumpiness. He also has 30yrs experience and overtakes where I wouldn't or couldn't on a teeny bike. Actually I'm happy to 'switch off' and just admire the scenery without worrying about changing gear and not crashing. My Fly knew the Cosat Brave years ago when it was all wild and untouched but I´ve never seen it - until now through your eyes. Sarah, your little jaunt sounds wonderful. Thanks for a great post. Glad you had a good time, The links were very interesting. Yes, Nick, we were very pleased to be free of any cloud issues. In fact we didn't realise there was a cloud until Friday when we got back, having studiously avoided keeping up with things in order to have a total break. @Johnny - thanks! Glad you enjoyed it.